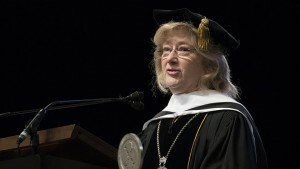 Dr. Ann Rondeau delivers the commencement address. 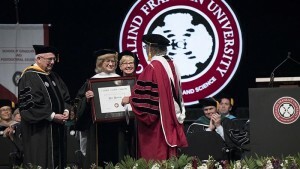 Dr. Rondeau receives her honorary degree. 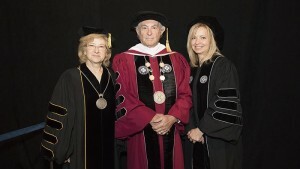 K. Michael Welch, MB, ChB, FRCP, President and CEO of RFUMS (center) awarded Retired Navy Vice Admiral Ann Rondeau, MA, EdD, president of the College of DuPage (left) and Jennifer Serino, director of the Lake County Workforce Development Department (right) the honorary degree Doctor of Humane Letters at the commencement celebration July 1. 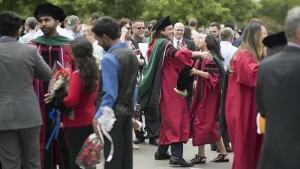 Following commencement, graduates continue to celebrate with friends and family. 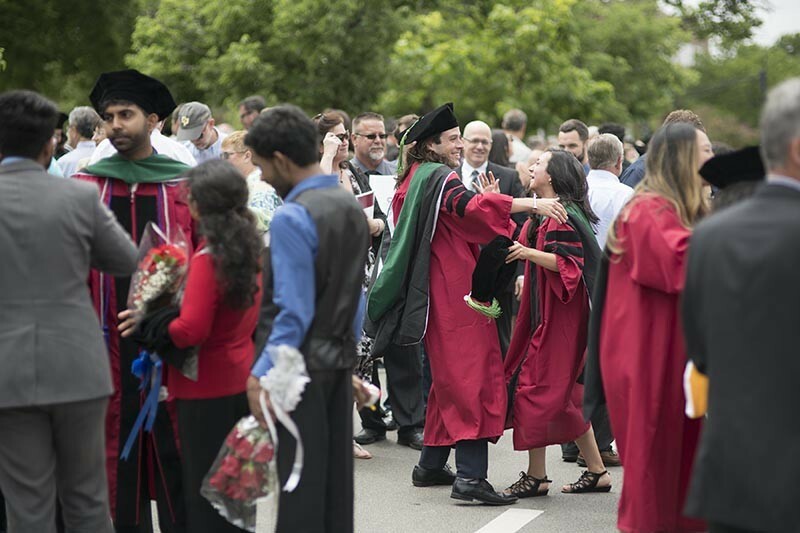 Commencement is a day of celebration for every graduate. 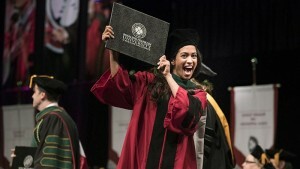 Rosalind Franklin University of Medicine and Science held its 104th Commencement Celebration on June 1 at the UIC Pavilion in Chicago. 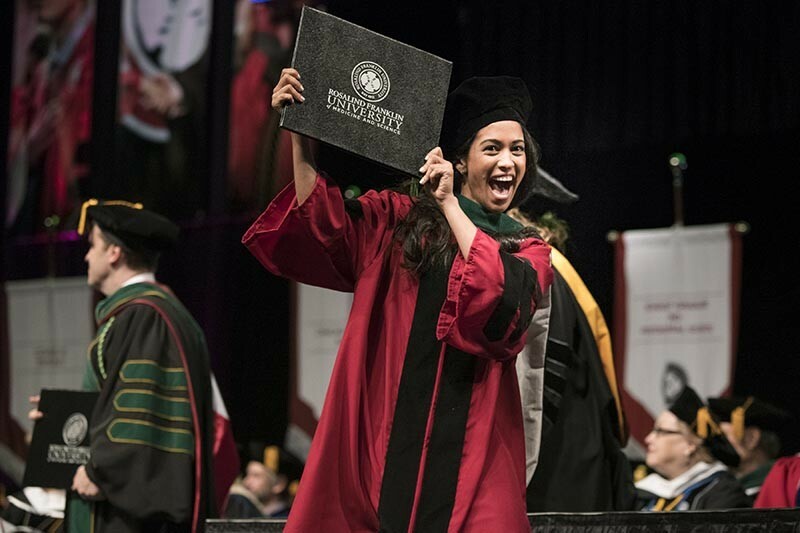 Members of the university’s Class of 2018 were awarded 680 graduate degrees in numerous biomedical and healthcare disciplines. “Today, we celebrate our community and our scholars who give back to the community in so many ways,” said Dr. Welch, who noted that years ago, inspired by the selfless example of RFU students, the university embedded community outreach and service into its curriculum. 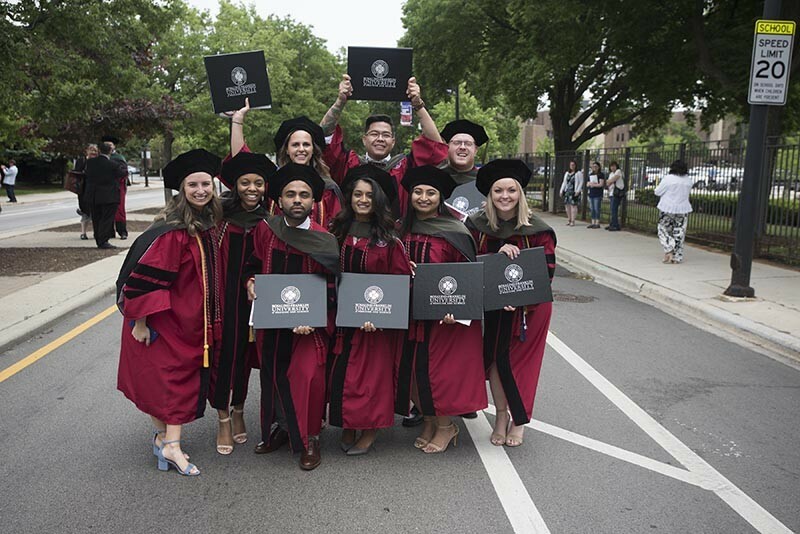 Founded in 1912, the university is a pioneer in the interprofessional education of future physicians and healthcare providers, who learn to work together as members of healthcare teams, a model shown to improve patient care and safety. 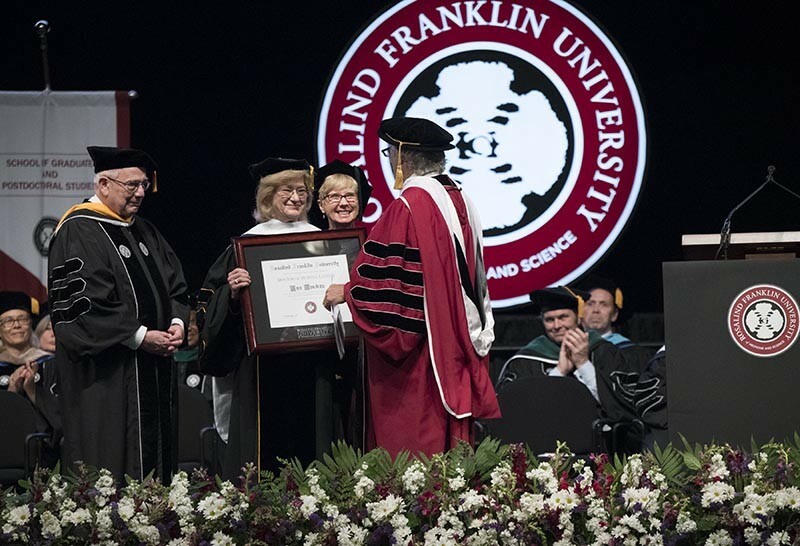 The Class of 2018, Dr. Welch said, joins the ranks of RFU graduates who understand that the science of healthcare delivery is essential, but not sufficient. 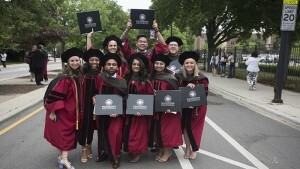 “Our graduates are also well trained in the skills associated with the art of delivering health care, skills that will endure in them even when the important advances in technology sometimes threaten the uniqueness of our relationship with our patients,” said Dr. Welch, a neurologist and internationally recognized expert in cerebrovascular disease, stroke and migraine. 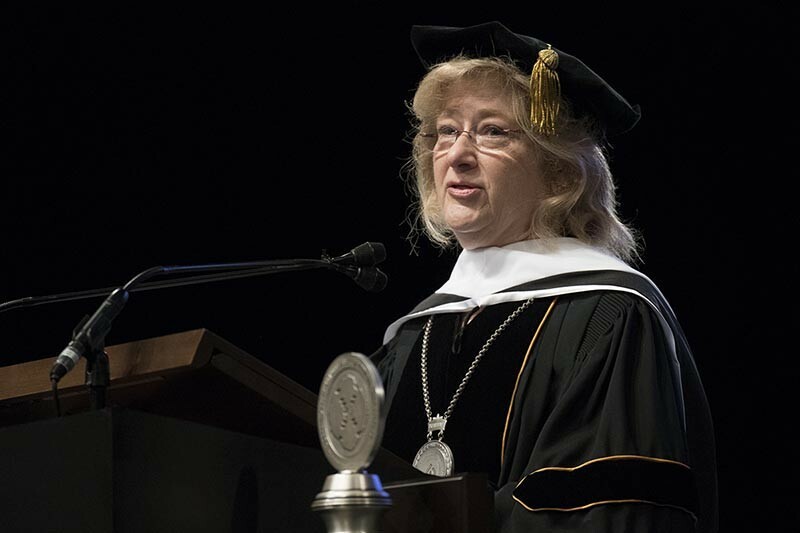 The ceremony included the awarding of the honorary degree Doctor of Humane Letters to two area leaders in education and workforce development: Jennifer Serino, director of the Lake County Workforce Development Department; and retired Navy Vice Admiral Ann Rondeau, MA, EdD, president of the College of DuPage, who delivered the commencement address. 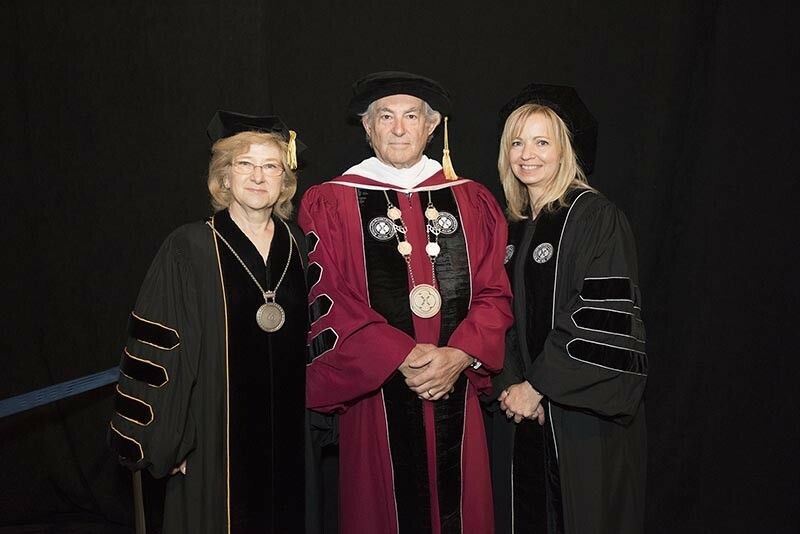 Dr. Welch credited both with removing obstacles to education and employment and for inspiring and supporting the university’s collaborative efforts with community partners to develop pathways into the health professions. As the first commander of the Naval Service Training Command headquartered at Great Lakes, IL, Dr. Rondeau played a foundational role in the establishment of the Captain James A. Lovell Federal Health Care Center, RFU’s clinical and research partner and the nation’s first fully-integrated federal health care facility, serving both veterans and active duty military and their families.